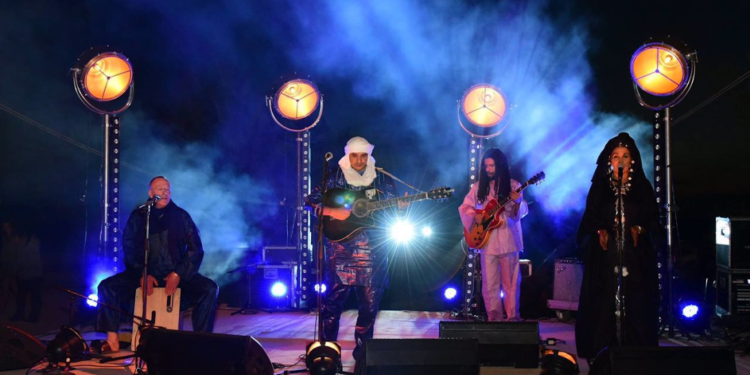 After performing at 10 different musical concert with Nigerian local artist between kaduna and Abuja ,the team of international France Based Guitarist that Storms Kaduna last month for Peace Concert in other to promote peaceful co-existence and religious tolerance have returned to their country. Atri N’assoup (the Star of the Desert) a Tuareg from Agadez, Niger Republic who is a citizen now in France for 12 years in Paris ,and who is the team leader of the band that arrived Nigeria with Ten Musicians ,said we are really grateful on seeing the way Nigerians really received us and dancing to the redeem of our music without any difference. Adding that the mission for the peace tour concert in Africa is to preach peace through Traditional and modern songs, and promote non-violence and peace among all generations, cultures and religions with support from local artists as well as international stars. Atri said we have perform with many Nigerian Artist on different stages using their instrument while I uses mine, and it is our hope to see that many Nigerian musician continued using music and organizing Big concert, in other to unite all the citizens of the country irrespective of Their religious, tribal and traditional difference, to move the country great. It has been observed that Since his arrived Nigeria early last month, Atri N’Assouf offers a cheerful and festive atmosphere to the northern cities of Nigeria through his music and above all good humour of his music which attracts many Nigerians to be a regular attendance his live concert from the two selected Northern cities Kaduna and Abuja and hoping before living the country going to perform in some other part of the country. Atri said Nigeria is blessed with many talented musician that unite the people,,and there fore it is up to them now to unite and always used music and a tool of bring diverse community into one place,so as to end all forms of crisis disturbing peace stability in the country. Responding shortly after the last performance in kaduna, at Gamji park ,Alhaji mohammed Ibrahim Gashas, who is the national president of Centre for fundamental Rights of protection initiative in Nigeria said “I have been hearing about the effort of the musician on what he has been doing to educate the societies on the importance of peace and unity in their society, that was the reason that really motivated me to immensely invite him to Nigeria to also organize such a concert that could bring many Nigeria into one place of living to tolerate one another. Gashas pointed out that the musician possess a Creativity, Enthusiasm, Flexibility, High Self-Esteem, Networking Skills:, Perseverance, Physical Stamina, Presentation Skills, Self-Discipline, Talent and he uses all his skills in preaching peace through traditional music. Gashas Atri N’assoup is a citizens of France, and a very intelligent musician that I have ever met,(when I met him some few month ago at Niger rep,he was performing peace song and then I invited him to come to Nigeria, so that we can also organize peace song that could unite the citizens, and surprisingly he accepted my proposal to come with his team to Kaduna. Meanwhile team of religious leaders under the leadership of pastor yohanna buru and other youth organization when to bids bye-bye and to appreciate his effort of bringing peace through musical concert in Nigeria,and hoping to see that he usually comes to the country and perform every year,so as to spread the message of peace through traditional and modernize forms of Music. Buru appeal to Nigerian musician to always organize peace concert to promote religious tolerance and better understanding among different faith –based organization which is aimed at uniting the people.